Do you remember your dreams? Are all your dreams happy? Do all your dreams always have an ending? Do you ever ponder about them after you are awake? Dream Writer by Tulika Publications touches upon this imaginative and vivid world of dreams. Shobha dreams every night but none of her dreams feels complete to her. When she wakes up in the morning she always remembers her dream but there is no definitive end to them. They leave little Shobha unsettled. Once she dreams of a boy who would talk non-stop. He talks so much that the words kept pouring out of his mouth in the form of sentences and dragged him down to the bottom of the sea. What happened after that is still a mystery because her father wakes her up. A few nights later, she dreams of two furry cats playing in the garden and her mother knitting a sweater with two wool balls orange and black. The alarm goes off and Shobha wakes up with a start only to find herself in her room without the cats. Perturbed by her incomplete dreams, Shobha decides to speak about it to her teacher. She wants to know the end to her dreams. Her teacher suggests that she start writing her dreams because that might help her find an answer to them. That’s how Shobha starts writing her dreams and each dream turns into a beautiful story, with definite ends to them. She knows what happened to the talkative boy and where the two little cats finally landed. She becomes a Dream Writer. 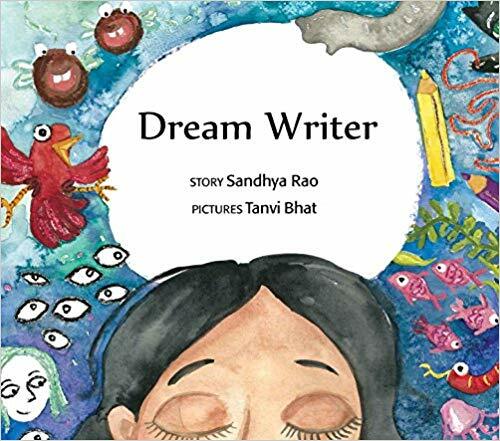 The story and its lovely illustrations by Tanvi Bhat transport you to the beautiful and mysterious world of dreams. The story can be a wonderful medium to encourage kids to start writing and illustrating their dreams and convert them into beautiful stories. Join the potentially life-altering 9-day Summit to watch FREE from home!